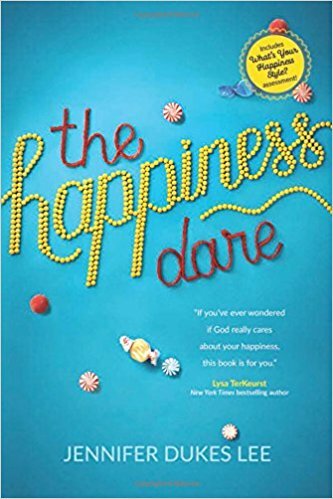 I’m late to the party that is The Happiness Dare by Jennifer Dukes Lee. It released last summer, but I saved it to kick off this summer. Yes, sometimes it’s a crisis. Sometimes it’s more like a cancer growing in secret for a long time. Actually, I’m more than a little like Beth. Beth is me. I said those words in a voice message to Jennifer Dukes Lee while sitting in one of my happy places, under the enormous oak tree at my church. It’s so big it has stone benches underneath it. At some point in my journey, I found myself asking the same question Lee did that led to the dare that then became the book: “God, do you want me to be happy?” The answer, I was certain, was no. With this big a loss? With this much collateral damage? Being happy felt more than a dare — it felt like a betrayal. As in, How dare I be happy after This. Something remarkable happened along the way: I found new ways to be happy. Most weren’t big. But I built so many of them into my day, like a shield of tiny pebbles to handle the inevitable ongoing disappointments and conflicts. Soon those small happinesses were all over the place. I wasn’t Happy, but I was experiencing a hundred happy moments each day. Things like tea blended with local lavender from the farmers market, reading a novel on my turquoise bench, a bike ride on my favorite route after the bridge was finally fixed, writing up a to-do list, watching a storm come in, visiting with my husband, listening to a new playlist on Spotify, inviting friends over for dinner and planning and cooking. I cultivated small happinesses because I had to. I didn’t know what my happiness style was and didn’t care. Just knew I needed to fight for it. When I finally took the happiness assessment in Lee’s book, my scores were remarkably similar. Four of them differed by only one point, and the leader wasn’t that far ahead of the pack. In short, I had been forced to diversify my happiness. And guess what? I got happier. Not big, giant Happy but a hundred small happys. Happy enough. If, like me, you’re late to the dare, no worries. I have a copy to give away! Leave a comment, and I’ll draw a name. How Many People Does It Take to Change Three Light Bulbs? We’d already struck out on the first try — my fault, not hers. Our small town DMV, which never used to take appointments, now did. Oops. Also we needed a one more piece of identification verifying residence. This was harder than usual because we moved in April, after my daughter got her W-2. We did have a bank statement with the new address, but her school transcript wouldn’t fly. Thankfully, I had needed her fancy schmancy birth certificate from the Bureau of Vital Statistics for her passport, and that official document was sent to the new address. The State of Texas taketh away and the State of Texas giveth. We had an appointment at the DMV in the next town. Two tall dudes joshed around with the clerk. This time, paperwork: good. Then my daughter and the driving instructor climbed in the truck and discovered that the third brake light was out: bad. She couldn’t take the driving test until it got fixed. It was 9:30 a.m. I’d been awake since 4:30, more nervous than my daughter. The DMV folks said if we could get the light fixed by 11, she could still take the driving test that day. So we headed to Walmart. This was one of those rare days when I had trouble reaching my husband by text or by, you know, actually calling. I wanted to know 1) Did he know the light was out? 2) Was it just a bulb or was there a more severe problem? and 3) Really? They won’t let you take the test with a bulb out? Answer to 1) Yes, 2) Probably just a bulb, 3) Really? The line in the auto care center at Walmart was long, at least an hour. We walked over to the SmartStyle so my daughter could get a haircut. My husband assured me that I could do this myself. All I needed to do was buy a screwdriver, take off the bulb cover, take out the bulbs, bring them inside and find new ones or get someone to help me find new ones, repeat in reverse. That makes my husband person No. 1 who helped me change a light bulb. Person No. 2 was Cooper, the man working the self-check kiosk at Walmart next to the SmartStyle. He’d been chatting with my daughter and I while we waited for it to open. Cooper went to college for a while, dropped out to care for both of his parents, then went back. He eventually got a master’s in physics and chemistry and worked for the U.S. Defense Department. He helped develop some kind of bomb that sounded like it was a plot point in a spy movie. He seemed to know everyone walking in to and out of the store. No one in auto had gotten to the truck yet. I checked to see what kind of screwdriver was needed (Phillips, and that’s the entire extent of my tool knowledge), and I went inside to buy a set. Checked out. Cooper showed me how to unscrew the screwdrivers from their protective case meant to protect them from thievery. Out to the truck. Unscrewed the brake light cover. Removed the three burnt bulbs, and took them inside. No such sign appeared. But I did spot the two dudes from the DMV. “Hey,” I said, “I saw y’all at the DMV. My third brake light is out, so my daughter can’t take her test. Can you help me find the right bulbs?” I pulled out the bulbs in their blackened glory. The DMV dudes were numbers 3 and 4 on the help list. One walked me over to where the lights were, and then he and his buddy compared and contrasted them — too big (*&@$%), too small (*&@$%), just right (*&@$%!) — until they found the bulbs I needed. On the top shelf. Over a foot above little old me. And then, ladies and gentleman, I replaced three light bulbs. By myself. “I did it!” I texted my husband. He sent back a thumbs-up emoji and a smiley face with sunglasses. “I am ridiculously proud of myself,” I wrote back. I reached SmartStyle just as my daughter was finishing, and I thanked Cooper for his help. He told her, “I wish you all of the luck.” We reached the DMV before our 11 a.m. deadline. She got her license. Sometimes you need more people to change a light bulb than you have light bulbs in need of changing. Installing three 912 bulbs by Sylvania took five people: my husband, Cooper, the two DMV dudes, and me. As my daughter goes to college this fall — far, far away, driver’s license in hand — she’ll need all of the luck. Some of it will still come from her father and me. Some will come from strangers. Some she will make herself and feel ridiculously proud. So it’s been a month and a bit more since I’ve been here. I could tell you what I’ve been doing but the only thing that matters is that I saw Moana. There is no love story in Moana, unless you count the love story between Moana and her people. That love is in tension with Moana’s love for the sea, the sea which chose her as a small child. Moana is the chief’s daughter, and she will be the island’s new chief. That fact is not in question. Her conflict is how does that fact reconcile with her pull toward the sea? How can she be who she is, where she is? The answer lies—as it often does in stories—in a cave. That’s where Moana has a vision of her people, who they used to be. As incoming chief it is her destiny to cross the sea and save them by helping them remember who they are. To accomplish this mission, she’ll need the help of a demigod, Maui, and together they’ll face down various monsters. Including a goddess who forgot who she was when she lost her heart. I’m happy to leave behind the songs and messages of Snow White for those of Moana. To be honest, I am a little weary of the sayings I grew up with: Be all that you can be. You can do anything you want to do. You can accomplish anything you put your mind to. There is a call. We all have one. And it is about us, sure, but it’s not only about us. Yes always, dear graduates. The call is not static. It moves us out and calls us in. It ebbs and flows. We strike out then fall back; hang back, then surge forward. We have a call not for self-actualization but because the land and the people have a need. The coconut trees are wasting from disease. The reef has been overfished. The only way out is for you to be who you are. Where you are will sort itself out. Same goes for me. For all of us, worldwide. The first scene that grabbed me is when Moana is leaving the island, hoping to sneak away when no one is looking, and Sina, her mother, finds her. Her mother knew—because mothers always know. She hugs Moana and lets her go. At this point, neither of them know that leaving will save the people. Sina lets Moana go anyway. The songs by Lin-Manuel Miranda are incredible, as I expected them to be. He knows who he is, and he writes songs and such to remind us who we are, wherever we are on this earth. And in the end Moana and her people find that where you are doesn’t matter as much as who you are. In the final scene she and her people are living their destiny as voyagers. Where will they land? It doesn’t matter. Tweetspeak Poetry has been running a series about the writing process behind my book, The Joy of Poetry. It’s adapted from a series I ran here earlier this year. We’re only two posts in, so it’s not too late to join us! And the next post will run this Friday, October 7. Monica Sharman, author of “Behold the Beauty,” calls herself a left-brained person who has learned to be a right-brained person. She studied physics at Caltech, the California Institute of Technology. Let’s call that her left-brained side, the side that wanted to write textbooks. “I never did turn into a famous author of science texts, but during my Caltech years I started reading the Bible,” Sharman writes. Sharman had always loved reading. So much so that she cannot remember not knowing how to read. Once she became a mom, she read to her children, a habit that has stuck even though her boys are big now. Meanwhile, Sharman started to write children’s books, which led to trying what she called “artsy things,” like poetry. “Now I’m a right-brained person, but I still retain my old nerdy engineer person,” she said. Sharman approaches Bible reading in unusual ways—some more left-brained, some drawing from the right side. That’s what “Behold the Beauty” is all about. The inspiration for Sharman’s book was, of course, another book, Karen Swallow Prior’s “Booked,” a memoir told through Prior’s favorite works of literature. Like Prior, Sharman employs a memoir-like approach to “Behold the Beauty.” The beginning of each chapter is a moment in her life — such as her reading history as a child or her time at Caltech — and the end of each chapter she calls an “invitation.” Each one is a particular way of approaching reading the Bible along with suggested Bible passages. “It’s initially subtle, indirect. If you read the chapter and wonder, ‘What does this have to do with Bible reading?’ that’s intentional. Subtlety shows a certain respect for the reader,” Sharman said. Sharman found that in a traditional church group setting, adults were afraid to answer questions, even easy ones. “One thing you see a lot is they skip the straight observation. They feel like they have to come up with some deep answer,” she said. But straight observation, Sharman believes, is a valuable tool. It’s one she learned through reading poetry. “It helps me slow down. It helps me savor the words and notice the words. Sometimes I think, ‘I don’t know what that means, but that is a cool phrase.’ I appreciate the words simply for the beauty,” Sharman said. Slowing down is a discipline Sharman continues to cultivate, especially when reading Christian articles or books or even blogs that contain Scripture. Did you notice anything interesting in that sentence? Sharman did: the lowing. Another way Sharman notices is by doodling or sketching a Bible passage, especially a difficult one. “It helps, if I come to a confusing part. I can just draw a diagram, kind of like a flow chart. Family trees help. Sometimes I really like diagramming sentences because it can make a confusing sentence more clear,” she said. Basically, Sharman just likes paper, an obsession she describes in chapter 4. She likes to read on paper, write on paper, sketch or diagram on paper. And she likes to fold paper. Origami. Sharman says she first found the word “memory” used in conjunction with paper in an origami book. “That’s what it is—you can’t uncrease a paper. It’s a permanent memory,” she said. Sometimes Sharman comes to the Bible using what she calls a “filter,” looking at a passage the way a journalist or a movie director might. She has a list of suggested filters in chapter 5. Number 9 on her list is “Discoveries About God.” It’s also the one she says she uses most often. In between her introduction to Bible study at Caltech and now, as a wife and mother of three boys, the stories resonate in different ways. What Sharman has learned about God through reading the Bible, through paying attention to the details, is the simple truth that God loves her. “To feed my excitement over God’s love for me, and to be more and more convinced of His greatness, I look carefully into the details of His Word,” Sharman writes. The chapter in which that statement occurs is called “Food Love.” It’s about a time Sharman catered a women’s retreat. She describes what she cooked and how, with loving detail. At one point a mistake turned into a scrumptious dessert. Those 32 attendees might not have realized it, but they were tasting love — love from Sharman, love from God. 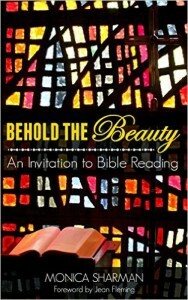 “Behold the Beauty” is available at Amazon. For those of you who know Dan King, the book is published by Bible Dude Press, a division of Fistbump Media. Sharman is not the only writer in her family. Her husband, Charles Sharman, is the author of “Through the Bible with my Child.” He is also the inventor of Crossbeams, a building toy and prototyping system for advanced children and adults. The Sharmans live in Colorado with their three sons.